This comprehensive guide compares the 25 most common materials used in CNC machining and helps you choose the right one for your application. 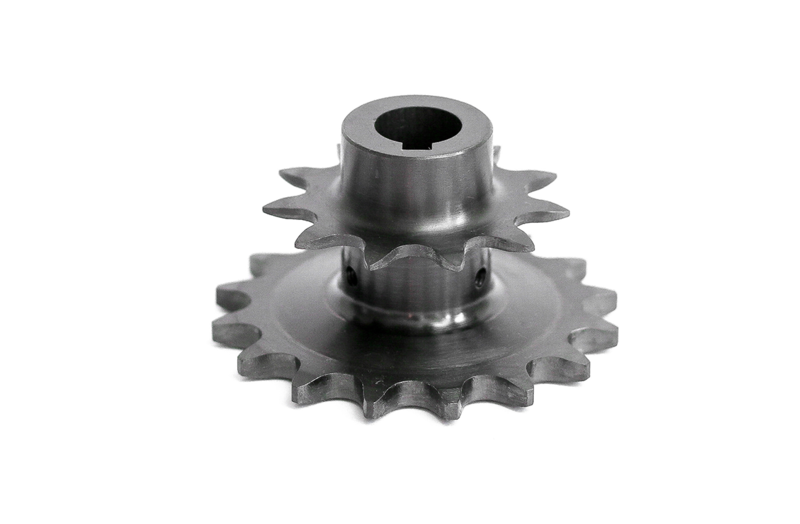 CNC machining can produce parts from almost any metal or plastic. Due to this wide range of available materials, the selecting the right one for your application can be challenging. In this article, we compare the most common CNC materials, in terms of mechanical and thermal properties, cost and typical applications. We summarized the information in easy-to-follow tables and graphs and give you specific details for each available CNC material option. For guidelines on designing parts for CNC machining and for useful tips to help you stay on budget, you can refer to our previous articles here and here. Step 1. Define the material requirements: These can include mechanical, thermal or other material requirements, as well as cost and surface finish. Consider the environment that the part will be used in and the components it will interact with. Step 2. Identify candidate materials: Pin down a few candidate materials that fulfill all (or most) of your design requirements. Step 3. Select the most suitable material: A compromise is usually required here between two or more of the design requirements (for example, mechanical performance and cost). In this article we will focus mainly on step two. Using the information presented below, you can identify the materials that are most suitable for your application, while keeping your project on budget. In the tables below, we summarized the relevant characteristics of the most common CNC materials, gathered by examining the datasheets provided by the material manufacturers. Metal and plastic materials were grouped together and compared with each other, as their properties differ greatly. Metals are mainly used in applications that require high strength, hardness, and thermal resistance. Plastics are lightweight materials with a wide range of physical properties, often used for their chemical resistance and electrical insulation properties. The materials properties of interest were the mechanical strength (expressed as tensile yield strength), the machinability (the ease of machining affects CNC pricing), the material cost, the hardness (mainly for metals) and the temperature resistance (mainly for plastics). The gathered information were summarized in the tables below. A detailed description of each material option is given in the next section. Aluminum alloys have an excellent strength-to-weight ratio, a high thermal and electrical conductivity and natural protection against corrosion. 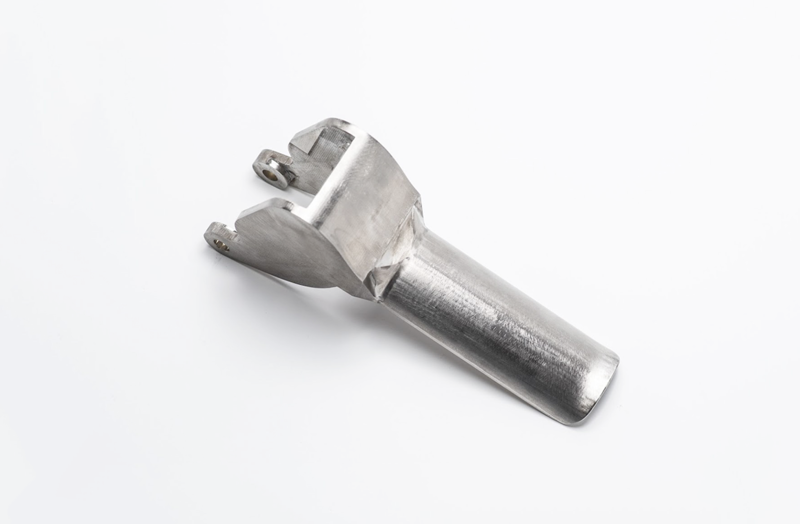 They can be easily machined and have a low bulk cost, so they are often the most economical option of creating custom metal parts and prototypes. Aluminium alloys typically have a lower strength and hardness than steels, but they can be anodized, creating a hard, protective layer on their surface. Aluminum 6061 is the most common, general-use aluminum alloy, with good strength-to-weight ratio and excellent machinability. Aluminum 6082 has similar composition and material properties to 6061. It is more commonly used in Europe, as it is compliant with British Standards. Aluminum 7075 is the alloy most commonly used in aerospace applications where weight reduction is critical, as it has excellent fatigue properties and can be heat treated to high strength and hardness, comparable to steels. Aluminum 5083 has higher strength than most other aluminum alloys and exceptional resistance to seawater, so it is commonly used for construction and marine applications. It is also an excellent choice for welding. Stainless steel alloys have high strength, high ductility, excellent wear and corrosion resistance and can be easily welded, machined and polished. Depending on their composition, they can be either (essentially) non-magnetic or magnetic. Stainless steel 304 is the most common stainless steel alloy and has excellent mechanical properties and good machinability. It is resistant to most environmental condition and corrosive media. Stainless steel 316 is another common stainless steel alloy with similar mechanical properties to 304. It has a higher corrosion and chemical resistance though, especially to saline solutions (for example seawater), so it is often preferred for applications in harsh environments. Stainless steel 2205 Duplex is the stainless steel alloy with the highest strength (double than other common stainless steel alloys) and has excellent resistance to corrosion. It is used in severe environments, with many applications in the Oil & Gas industry. Stainless steel 303 has excellent toughness, but lower corrosion resistance compared to 304. 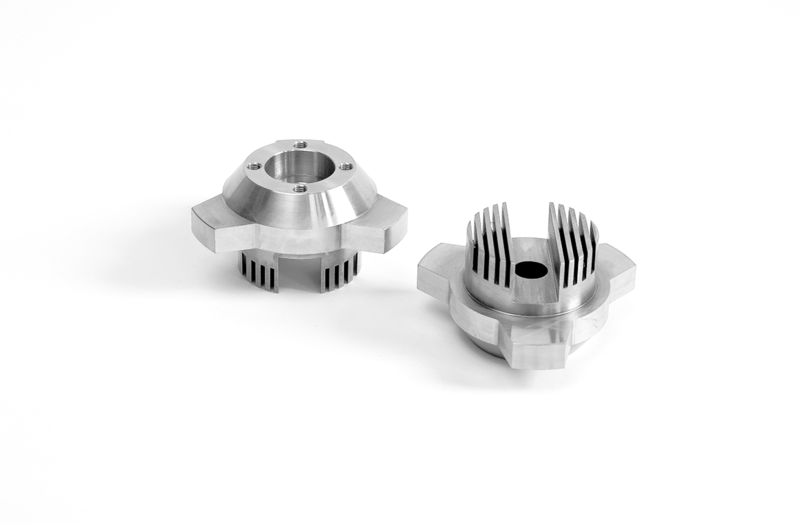 Due to its excellent machinability, it is often used in high-volume applications, such as the manufacturing of nuts and bolts for aerospace applications. Stainless steel 17-4 (SAE grade 630) has mechanical properties comparable to 304. It can be precipitation hardened to a very high degree (comparable to tool steels) and has excellent chemical resistance, making it suitable for very high-performance applications, such as the manufacturing of turbine blades. Mild steels are also known as low-carbon steels and have good mechanical properties, great machinability, and good weldability. Due to their low cost, they find general-purpose applications, including the manufacturing of machine parts, jigs, and fixtures. Mild steels are susceptible to corrosion and attacks from chemicals. Mild steel 1018 is a general-use alloy with good machinability and weldability and excellent toughness, strength, and hardness. It is the most commonly used mild steel alloy. Mild steel 1045 is a medium carbon steel with good weldability, good machinability, and high strength and impact resistance. Mild steel A36 is a common structural steel with good weldability. It is suitable for a variety of industrial and construction applications. Alloy steels contain other alloying elements in addition to carbon, resulting in improved hardness, toughness, fatigue and wear resistance. Similarly to mild steels, alloy steels are susceptible to corrosion and attacks from chemicals. Alloy steel 4140 has good overall mechanical properties, with good strength and toughness. This alloy is suitable for many industrial applications but is not recommended for welding. Alloy steel 4340 can be heat treated to high levels of strength and hardness, while maintaining its good toughness, wear resistance and fatigue strength. This alloy is weldable. 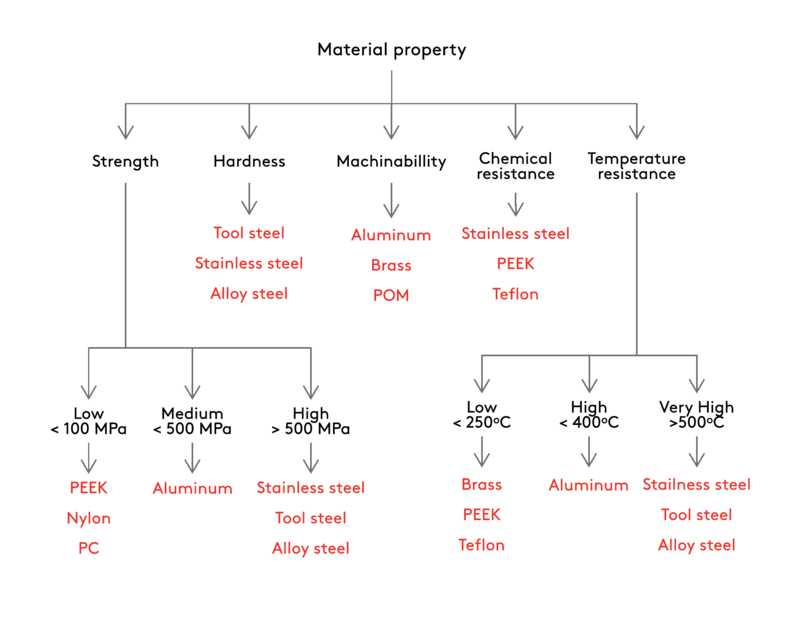 Tool steels are metal alloys with exceptionally high hardness, stiffness, abrasion and thermal resistance. They are used to create manufacturing tools (hence the name), such as dies, stamps, and molds. To achieve their good mechanical properties, they must undergo a heat treatment. Tool steel D2 is a wear-resistant alloy that retains its hardness to a temperature of 425°C. It is commonly used to manufacture cutting tools and dies. Tool steel A2 is an air-hardened general purpose tool steel with good toughness and excellent dimensional stability at elevated temperatures. It is commonly used to manufacture injection molding dies. Tool steel O1 is an oil-hardened alloy with a high hardness of 65 HRC. Commonly used for knives and cutting tools. 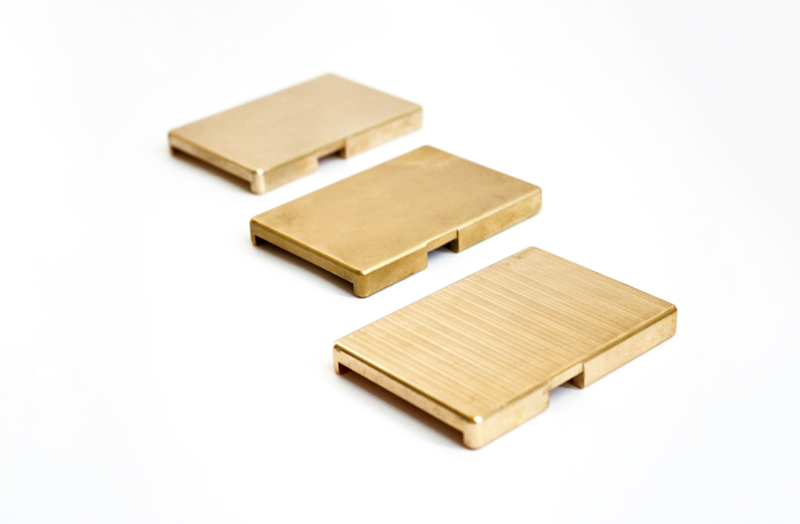 Brass is a metal alloy with good machinability and excellent electrical conductivity, ideal for applications that require low friction. It is also commonly used in architecture to create parts with a golden appearance for aesthetic purposes. Brass C36000 is a material with high tensile strength and natural corrosion resistance. 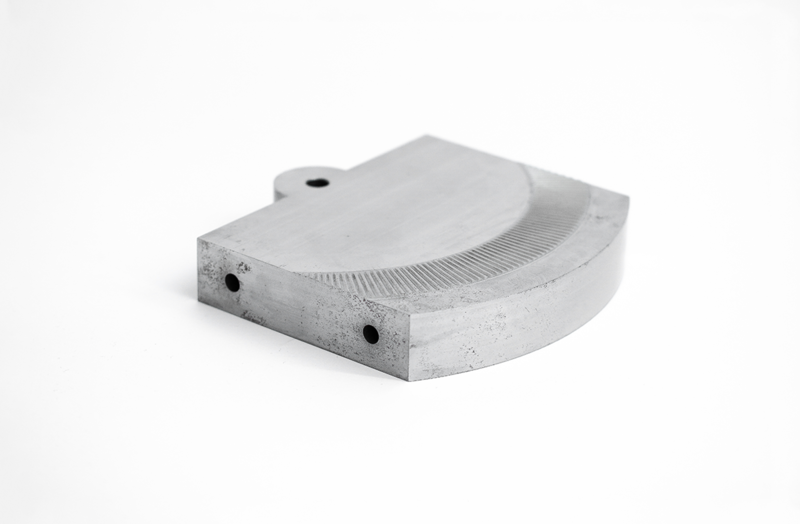 It is one of the most easily machinable materials, so it is often used for high volume applications. 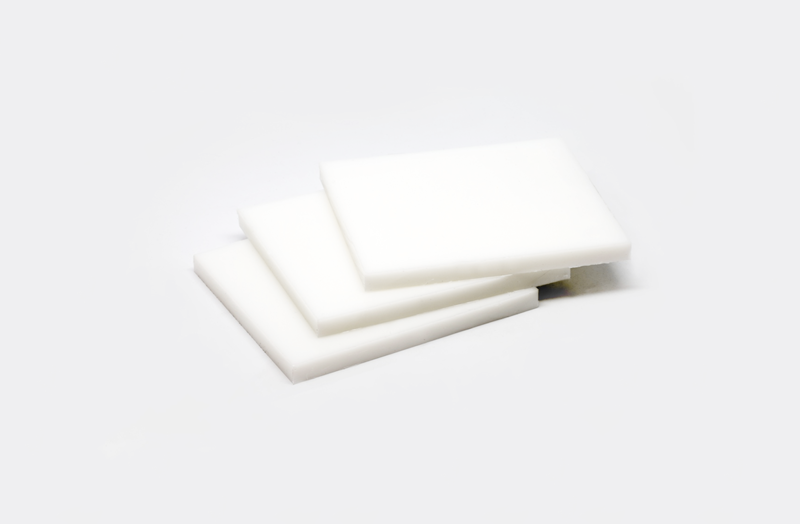 ABS is one of the most common thermoplastic materials offering good mechanical properties, excellent impact strength, high heat resistance and good machinability. 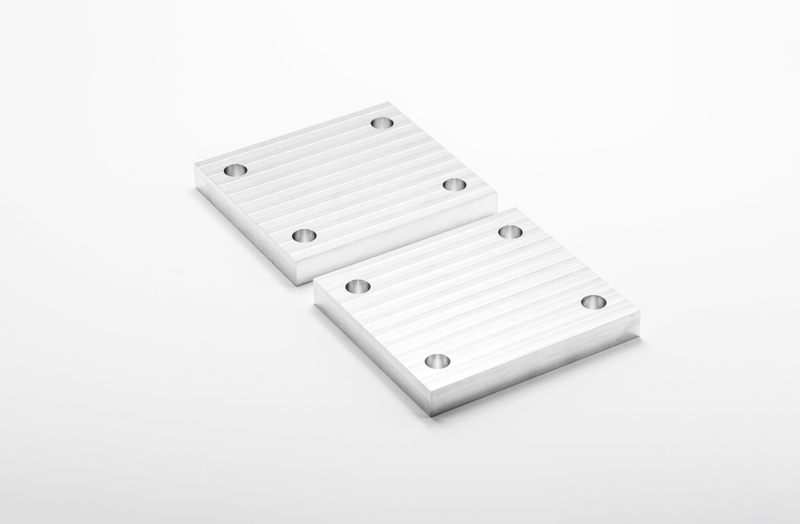 ABS has low density, making it ideal for lightweight applications. 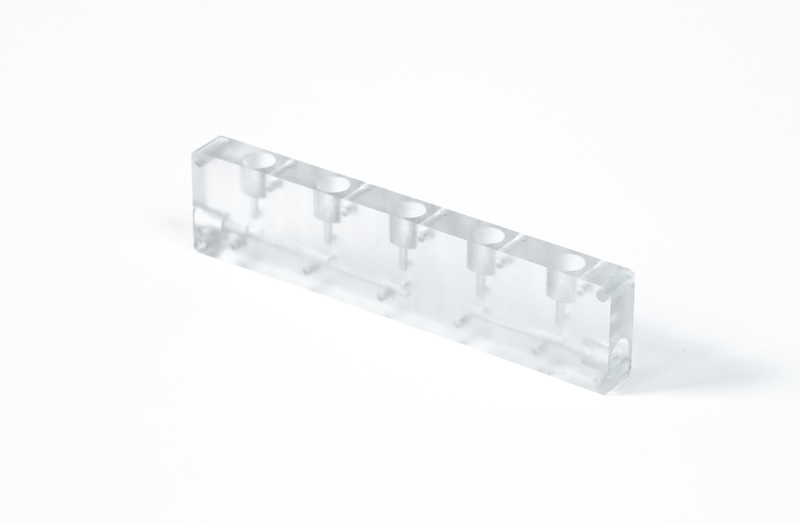 CNC machined ABS parts are often used as prototypes prior to mass-production with injection molding. Nylon is also known as polyamide (PA) and is a thermoplastic that is often used for engineering applications, due to its excellent mechanical properties, good impact strength and high chemical and abrasion resistance. It is susceptible to water and moisture absorption though. Nylon 6 and nylon 66 are the grades that are most commonly used in CNC machining. Polycarbonate is a thermoplastic with high toughness, good machinability and excellent impact strength (better than ABS). It can be colored, but typically it is optically transparent, making it ideal for a wide range of applications, including fluidic devices or automotive glazing. POM is commonly known with the commercial name Delrin, and it is an engineering thermoplastic with the highest machinability among plastics. 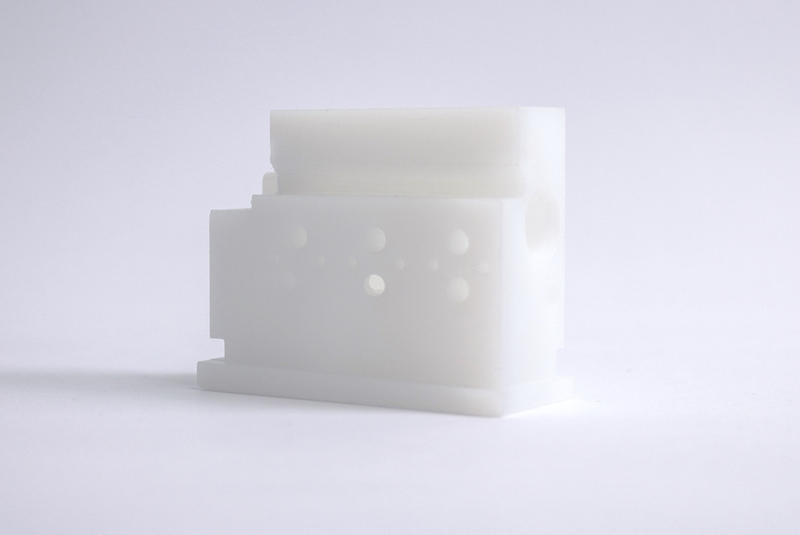 POM (Delrin) is often the best choice when CNC machining plastic parts that require high precision, high stiffness, low friction, excellent dimensional stability at elevated temperatures and very low water absorption. PTFE is commonly known as Teflon, and is an engineering thermoplastic with excellent chemical and thermal resistance and the lowest coefficient of friction of any known solid. 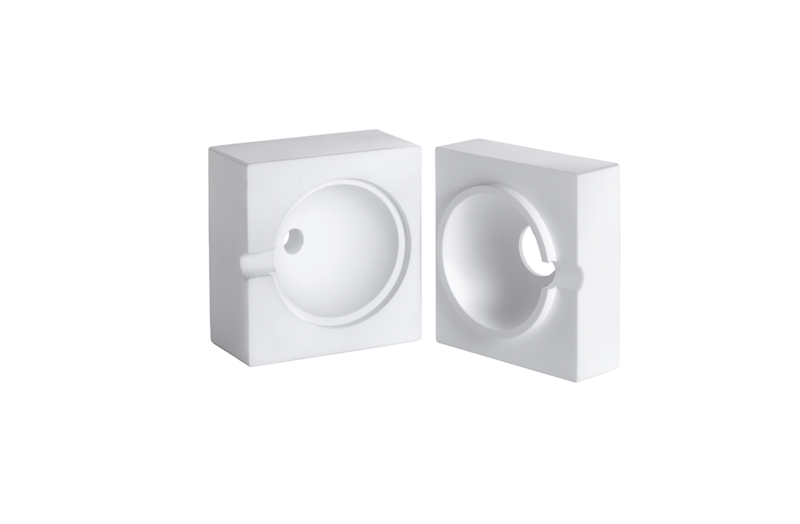 PTFE (Teflon) is one of the few plastics that can withstand operational temperatures above 200oC and is an outstanding electrical insulator. Nevertheless, it has pure mechanical properties and it is often used as a lining or insert in an assembly. High-density polyethylene (HDPE) is a thermoplastic with a high strength-to-weight ratio, high impact strength, and good weather resistance. 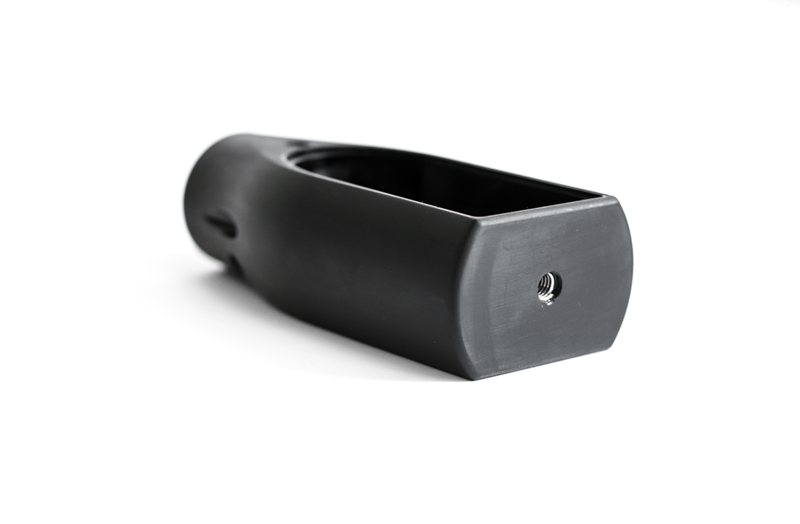 HDPE is a lightweight thermoplastic, suitable for outdoor use and piping. Like ABS, it is often used to create prototypes before Injection Molding. PEEK is a high-performance engineering thermoplastic with excellent mechanical properties, thermal stability over a very wide range of temperatures and excellent resistance to most chemicals. PEEK is often used to replace metal parts due to its high strength-to-weight ratio. Medical grades are also available, making PEEK suitable also for biomedical application. Aluminum 6061 is the most common CNC machining material with the lowest cost. 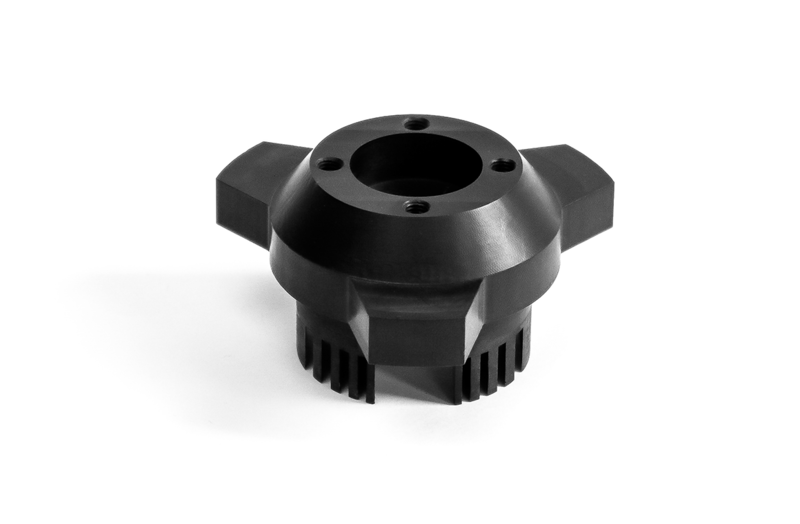 POM (Delrin) is the most economic CNC plastic, due to its excellent machinability. Choose a metal alloy for applications that require high strength, hardness and/or temperature resistance. 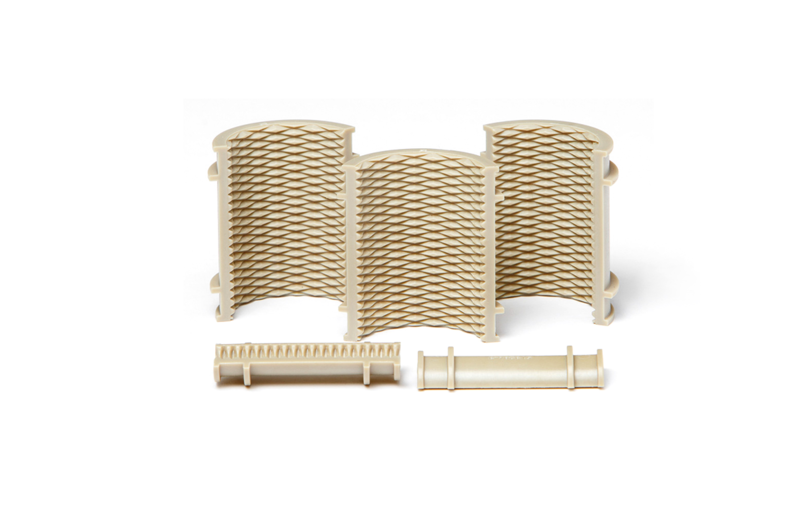 Choose plastics for lightweight applications with special material requirements or for prototypes prior to injection molding. Compare the main SLA 3D printing resins - standard, tough, durable, heat resistant, rubber-like, dental and castable - by material properties and find the best option for your application. Learn how heat treatments affect the properties of the most common CNC metal alloys and how to request a specific heat treatment in your order.